More often than I would like, I find myself in the car with two noisy whiny kiddos. You know the scene, "Mama, she's touching me!" and "Are we there yet?" Daddy works out of town, and there are times we have to drive 2-3 hours to go see him. Nana lives about 45 minutes away, Grammy lives about 20 minutes away... Basically, if we want to see anyone, we have to travel. The kids get bored, though, and going anywhere turns into a bigger headache than anyone wants to deal with. Sure, we've tried bringing coloring books in the car, and snacks. So it goes without saying that I have animal crackers crunched in the floor and broken crayons up under the seats. I can't tell you how excited I was when Kids Go Co contacted me about sending a sample ZoomKIT to review. Seriously, a kit to keep them occupied in the backseat? Sold! 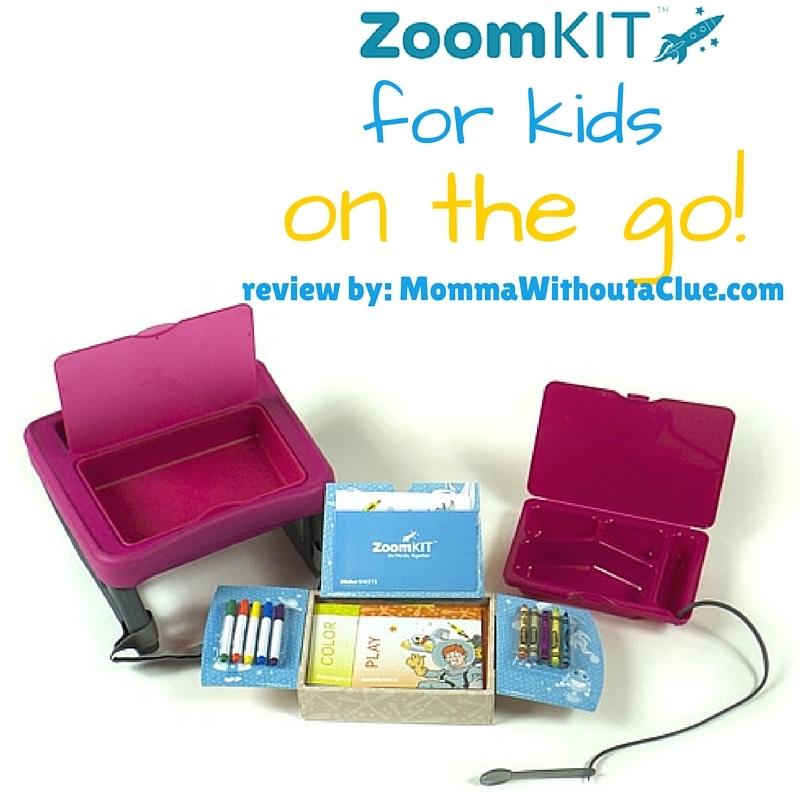 We received the ZoomKIT & Activity Insert Bundle, with the ZoomKIT table, ZoomART & ZoomSNACK and little miss Terrible Twos loves it. We've had it several months now, and still don't leave the house without it. She just calls it her "tray" but I call it my lifesaver. Here's how we use the ZoomKIT. See that little lunchbox looking one? That's the ZoomSNACK. I'll add some little snacks like crackers and apple slices into the compartments and then close it up to keep in the front seat. Then after I get her buckled in, I put the ZoomKIT table in her lap and strap the velcro belt around her waist, because there's nothing worse than a dropped toy that can't be reached. We usually keep some smaller dolls and cars in the tray, and when she gets bored with those, I'll pull out the ZoomART set. With markers, crayons, stickers, and coloring books, it keeps her busy and entertained (and quiet!) for a long time. A long time isn't forever, though, so when she starts pelting me with crayons from the backseat I'll break out the snack box and pop it into her tray. She's happy, I'm happy, and car rides have gotten a lot smoother since we got the ZoomKIT. It isn't just for car trips, though! We bring the ZoomKIT to doctor appointments and it keeps her entertained while we wait. I don't have to worry about her playing with germy toys that a ton of other snotty kids sneezed on, and she's happy because she brings her favorite little dolls. 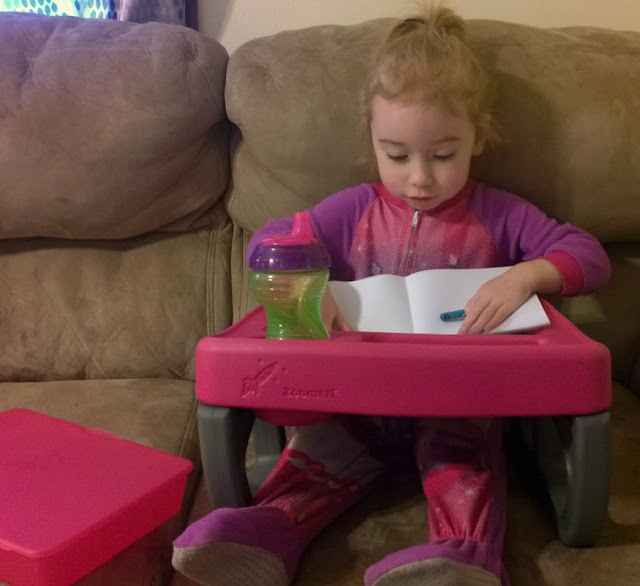 She even pulls it out when she wakes up in the morning, to color while Mama's waiting for the coffee to kick in. Seriously, if you don't have a ZoomKIT yet, you should definitely look into getting one! Visit their website at www.kidsgoco.com for more information.